New Year always gives me a feeling of good cheer and optimism. As president and CEO of the Institute, good cheer comes from celebrating the effort of thousands of insurance professionals across Canada who pursued an insurance education in 2016. Your education and professional development comes in many different ways. Some of you took courses leading to the Chartered Insurance Professional (CIP) or Fellow Chartered Insurance Professional (FCIP) designations. Others took courses leading to our Advanced CIP and Risk Management certificates. To keep pace with changes in the p&c marketplace, many of you acquired specialized insights or knowledge through our new catalogue of online continuing education courses (called CE OnDemand); registered for our local seminars and webinars; or read our industry research and trends reports. However you learned, you are improving the p&c industry as a whole, making it more trustworthy, more credible and more knowledgeable in the eyes of Canadians, the Conference Board of Canada found in a recent study. You have also proven your commitment to your professional excellence and career within the p&c industry. CIP and FCIP graduates feel justifiably optimistic about their futures. Eighty per cent of p&c employees in the Conference Board study** said the CIP designation led to better career prospects. Seventy-nine per cent of p&c companies agreed there are more industry opportunities for those with a CIP designation. What are these career opportunities? I hope you will take the time to find out during National Education Month in February 2017. 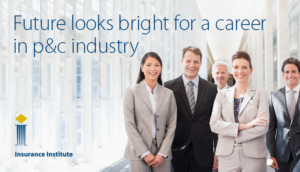 I am excited to see career mapping take centre stage in February with the rollout of mycareer, a new Institute online resource offered at no cost to help insurance professionals chart their careers within the p&c industry. mycareer can help you focus your career conversations with your managers, HR representatives, or even with mentors and other insurance professionals, so that you can plan your next career challenge. Many networking opportunities are available for insurance professionals to discuss educational and professional development opportunities during National Education Month. Local Institutes will be visiting and holding open houses for companies and insurance professionals. Plus, look for video contests, trivia contests, seminars, webinars, social events such as axe-throwing and bubble soccer tournaments, and more. This is an ideal time to discuss career goals with employers, mentors and peers. And of course, the Institute is available at any time to help you with your educational and career development. Best wishes to you for a happy and prosperous 2017. ** The Conference Board surveyed more than 1,000 stakeholders in the p&c industry, including 848 p&c industry employees and companies employing more than 150,000 people across Canada.